BEIJING, Oct. 26 (Xinhua) -- China and Japan should cherish and maintain positive momentum in bilateral ties development and move the relationship steadily forward on the right track, Premier Li Keqiang said during talks with Japanese Prime Minister Shinzo Abe on Friday in Beijing. Abe's three-day official visit to China since Thursday is the first one by a Japanese prime minister in seven years. "China attaches importance to relations with Japan," Li said. "A healthy and steady development of bilateral relationship serves the fundamental interests of the two neighboring countries and the two peoples and is crucial to the region and the world." He called on the two sides to "cherish and maintain positive momentum in bilateral ties development, further enhance benign interaction, properly handle sensitive issues including history, Taiwan and East China Sea, so as to enable a continuous improvement of bilateral relations." "China is willing to promote the ties on the basis of principles of the four political documents between the two countries and the spirit of 'taking history as a mirror and facing to the future' after bilateral relations returned to the right track," Li said. China stands ready to have dialogue with Japan in political and economic issues, enhance policy communication and coordination, intensify cooperation in areas including innovation, energy-saving and environmental protection, elderly care, finance, disaster prevention and agriculture, and build the third-party market cooperation as a new pillar of bilateral pragmatic cooperation, he said. He called for an early establishment of a direct hotline between the two defense ministries under a maritime and air liaison system and enhanced communication of maritime law enforcement authorities in the hope of turning the East China Sea into "a sea of peace, cooperation and friendship." The Chinese premier also encouraged the two countries to speed up judicial and law enforcement cooperation, enhance exchanges and mutual learning in youth, sports and local governments, and take effective measures to facilitate personnel exchanges. Li said China and Japan, as world's two major economies, should jointly uphold multilateralism and free trade and promote the building of an open world economy. He called for accelerated negotiations on a free trade zone among China, Japan and the Republic of Korea, and on the Regional Comprehensive Economic Partnership (RCEP), to boost trade and investment in the region and jointly build an East Asia economic community to promote the process of the Asia-Pacific regional integration. Abe voiced the expectation of starting a new phase of bilateral ties featuring a shift "from competition to coordination." Japan and China are important neighbors and strategic partners, posing no threats to each other, Abe said, adding that China's development is an important opportunity for Japan. He said Japan stands ready to work with China to enhance the momentum of high-level exchanges, promote strategic communication, strengthen cooperation and exchanges in economy and trade, investment, finance, innovation, the third-party market, youth, sports and local on the basis of the four political documents between the two countries. He called on both sides to push for concrete progresses of the RCEP negotiation and the building of a free and fair international economic order, and contribute to the free trade and world economy. Prior to the talks, Li held a welcoming ceremony for Abe. After the talks, Li and Abe witnessed the signing of more than 10 intergovernmental cooperation agreements on politics, innovation, finance, customs and sports. During a joint press conference with Abe after the talks, Li said both sides agreed to enhance the high-level guidance of bilateral ties and continue to give play to the China-Japan high-level political and economic dialogues, encouraging the two sides to unleash comparative advantages and continue dialogue and exchange on diplomacy, macro-economy, finance, commerce, culture and defense. In order to further enhance people-to-people exchanges, the year 2019 will see the promotion of China-Japan youth exchange, and the two countries will take the opportunity of hosting the 2020 Tokyo Olympic Games and the 2022 Beijing Winter Olympic Games, respectively, to enhance exchanges, Li said. Also on Friday, Li and Abe delivered speeches at the first forum of China-Japan cooperation on third-party market cooperation. "Pragmatic cooperation serves as a ballast and thruster of China-Japan ties," Li said. 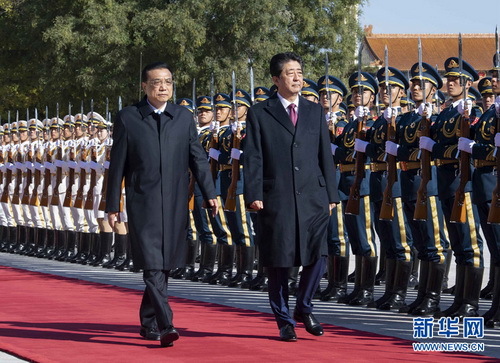 Li said that during his visit to Japan in May, he and Abe reached consensus on third-party market cooperation and there were several successful examples of cooperation. Some 50 business agreements worth 18 billion U.S. dollars had been signed between Chinese and Japanese local governments, companies and financial institutions during the forum. Li said this showed that China and Japan enjoyed huge potential and broad prospects on third-party market cooperation, which would become a pillar of bilateral cooperation. On innovation cooperation, Li said China would forge ahead opening-up, make market regulation fairer, strictly protect intellectual property rights and create a market-oriented, law-based and international business environment. "We welcome Japanese enterprises to take the opportunities of the new round of opening-up and invest in China," Li said. "China is willing to enhance financial cooperation with Japan through means including currency swap, to better support the cooperation between Chinese and Japanese businesses." Saying that Japan and China had a long history of bilateral cooperation, Abe called on the two countries to cooperate and coordinate to jointly face up to issues in the region and the world. By following principles of openness, transparency and market-oriented operation, Japan stands ready to work with China to conduct third-party cooperation projects that comply with the host country's needs and international norms for win-win results and contributions to regional and world development, Abe said. Some 1,500 representatives from the two countries attended the forum.